It’s going to be a very busy fortnight. With That Potent Alchemy coming out in October, and some very sweet sales deals in the works for readers, I figured it was time to start making a proper mailing list for this stuff rather than fling information out into the abyss and hope readers see it. My current plans are to send out updates on a monthly basis, with book news, upcoming sales, giveaways and maybe some extra goodies for mailing list members. So if you want to hear about everything first, ask weird questions, be sure never to miss an update or a discount, and be first in line for promo goodies, add yourself on the form. I will never spam, or give email addresses to anyone else, and you can unsubscribe at any time. Subscribe to the mailing list and never miss a release! 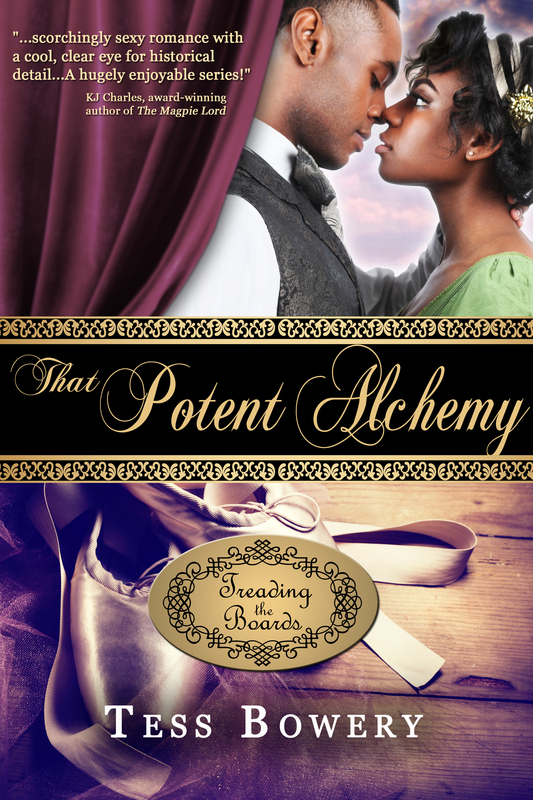 That Potent Alchemy – Cover Reveal! What time is it again? It’s Tess Avoids Work By Doing Book Promo time again! Except I’m actually really excited about this. Cover reveal time! For the third and officially-final book in the Treading the Boards ‘trilogy,’ That Potent Alchemy. Without further ado… meet Grace and Isaac! Featuring a gender-fluid ballet dancer, an amateur chemist who only occasionally starts fires, and an old rivalry that could tear them apart. So. The book is available for pre-order NOW, and will release officially on October 4th. I do have a number of (free) Advance Reader Copies available, offered in return for an honest review. If you’d like a copy of TPA to review for your blog, please let me know in the comments here, find me on twitter or on tumblr. That Potent Alchemy – coming in October! That Potent Alchemy: releasing October 4th, in print and on all platforms. Grace changed briskly, washed, and packed her bag once more, heading out into the bright afternoon. The sun was too hot, the walk from the school to the theatre too long, and the salve she’d rubbed on the raw skin on her feet was doing nothing useful. Why had she agreed to this? Because she didn’t feel like looking for new employment, and worse yet, because she had been briefly swayed by the thought that she might find a man attractive. Honestly, what had become of her? She was supposed to be calm, steady Grace. Supportive, strong, independent Grace. That was what everyone expected of her. Not whatever sort of…acquiescent, submissive girl she was turning back into. Of course there were times when she longed for someone to take her under their wing, the way she had done for so many others. For it to be her turn to have someone draw a hot bath, rub liniment on her sore muscles, brew a cup of tea for her and set a hot Chelsea bun on the plate beside. Just because. But that didn’t make her weak, or childish, or easy to push around. Elliston and his wife had no business trying to force her into a role she was uneager to play. If they wanted La Camargo back, let them go to Belgium and dig her up in the churchyard. And fie on Mr. Caird for that matter, who couldn’t have simply left her alone. If he hadn’t started those conversations, she’d never have been curious about him. If she’d never been intrigued, then she would have had nothing to keep her at the Surrey. And if she’d quit like she should have, well! Her feet wouldn’t be hurting now, would they? So it was all, essentially, his fault. Grace had worked herself into a properly indignant strop by the time she arrived back at the Surrey to find the building mostly empty. Rehearsals had ended for the day, the theatre deserted but for a few boys having a war with their brooms on the stage. Lucy had already gone. The dressing room above stairs was empty as well, except for the usual debris—shoes kicked under the bench, a sweaty shift badly in need of laundering draped over the arm of a chair, and three washcloths piled in a damp heap on the stand beside the water jug. And at Grace’s usual mirror, her boy’s cap set on the corner of her dressing table, something new. A white gauze sweet bag, tied with a delicate satin ribbon. Grace set her own satchel down and approached her dressing table slowly. There was no card or note, no suggestion of the giver or the intended recipient. Perhaps it was meant for Lucy, or one of the other girls? She picked up the bag and tugged on the ribbon; that was when she knew. The little sweet bag fell open, the sides bulging from the contents. It held a good handful or two of candied nuts, the warm sugar smell of the confection cloying and too sickly-sweet. Who else would have left her nuts? She had turned him down upstairs, refused his offer of sweetmeats there. Was this his reaction? To press gifts upon her again, in the hopes that she wouldn’t know whom to refuse? Honestly, he’d caused enough trouble for her already. Her stomach growled and she ignored the urge. He would know, somehow, even if she only ate one. And that would mean he was winning. She had no answer for that, but still the feeling lingered. Grace took the bag and headed around the corner, up the stairs again, until she reached the little door that led into the loft. It was closed, which meant she could just slip in, give back the bag, and slip out again. She turned the handle, then held very still. Were those footsteps beyond? Was he in there? Running in to Mr. Caird again had not been part of her plan. She waited, holding her breath, her heart thumping treacherously in her chest. The shuffling sound didn’t come again. 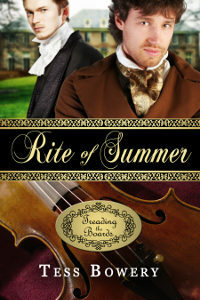 With more desire than ever to get the entire thing over with, she pushed open the loft door, and strode inside. The setting sun meant no warm golden pools of light on the floor this time. That was for the best. Her eyes played tricks on her when a shadow seemed to shift at the far end, but when she looked right at it, the room was still. Exhaustion, that was what it was. Already overworked, and it was only her first day. Grace strode purposefully across the room, and set the sweet bag firmly down on the middle of Mr. Caird’s workbench, where he would be sure to see it. And then for good measure, she searched the messy tabletop until she found a little bit of pencil, the wooden end splintered and chewed, and the little green book he’d used to make all his notes. No, she wouldn’t rip a page from a book—she wasn’t that far gone. A different scrap of paper, then, without too many scratched-out annotations on it, and a blank side on which to write. Grace licked the end of the pencil and wrote her note. I don’t accept gifts from strangers. She left it propped up beside the bag. Let that be an end to all of this nonsense. That Potent Alchemy release date – October 4, 2016! I’ve got a page set up for it and everything. 🙂 The cover reveal will come closer to the date. She Whom I Love – Bisexual Book Awards Nominations! What an amazing week it’s been! 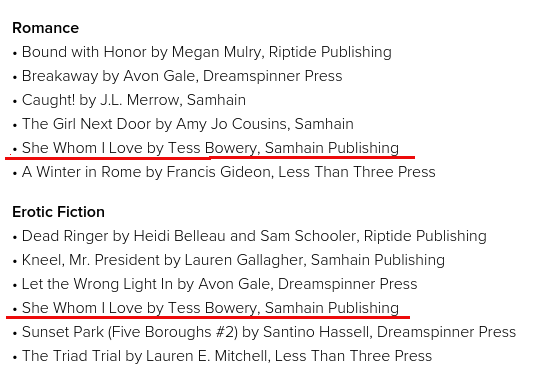 She Whom I Love has just been nominated in two categories for this year’s Bisexual Book Awards. I’m so beyond thrilled at the honour and at the amazing company I’m keeping. 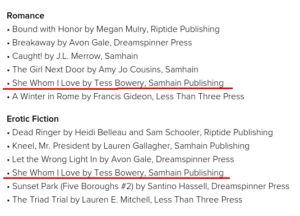 I’m extremely proud of this book, and the team at Samhain who made it shine (Amy and Gabrielle, shout out to you!). I am having such a large glass of wine tonight. Oh my GOD. She Whom I Love in Amazon top ten! See? It’s me! So cool. For reviewers interested in getting a sneak-peek at May’s hottest gay romance release: High Contrast, the first book in Evolution Ink, is available for request on Netgalley. Meet Jacob, Cody and the rest of the gang at the best little body mod studio in Harlem. Release day is May 3rd. There are a thousand blog posts to be written about the paucity of stock photography of women and men of colour, even fewer that are in any way emotional and sweet enough to be used as covers for romance. Rather than reiterating what more eloquent voices than mine have said, I’ll jump to what I’m doing, in my own small way, to make a contribution. At the beginning of the year, I partnered with Mosaic Stock Photography to design a custom photo shoot for the cover of the next Treading The Boards story, That Potent Alchemy. TPA stars Grace, whom we fell in love with in She Whom I Love, and her suitor Isaac, a mechanist and special-effects expert at the Surrey Theatre in London, 1811. Finding black women and men for romance covers is one problem; finding a couple where the heroine is dark skinned and the pair are in reasonably-accurate-ish Regency clothing is another disaster entirely. It simply wasn’t going to happen with the photos available out there. In a handful of weeks, though, Mosaic Stock booked my first choice of models, found the costuming we needed, and arranged for a shoot that blew my mind. Here’s a teaser sample of the (proofs) photos we shot two weeks ago, and I’ll do a cover reveal for That Potent Alchemy when we get closer to the release date this fall! High Contrast is now on Goodreads! Now that She Whom I Love has launched (and if you haven’t picked it up yet, go do that right now! 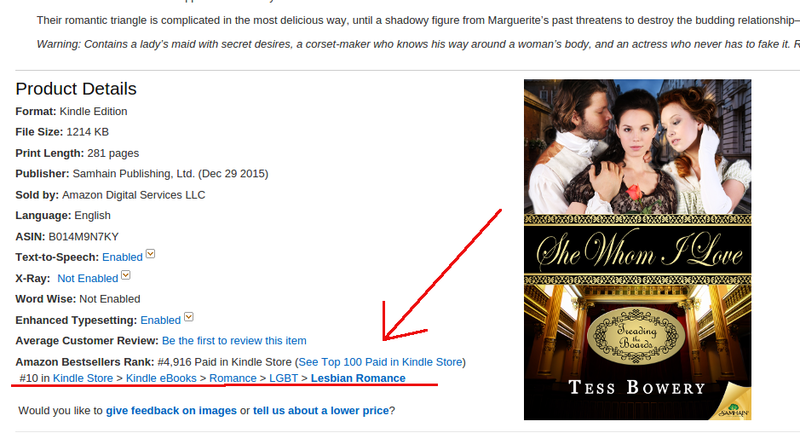 Purchase links are available for five different vendors in the dropdown on the right — click the book cover.) … what was I saying? Ah, yes! As She Whom I Love has launched and is now pulling some wonderful reviews, it’s time to give you a sneak peek at the next book! While there’s another Treading the Boards book coming in the fall (That Potent Alchemy – Grace’s story), my next release the the beginning of a whole new series. Follow the kids of Evolution Ink in a new contemporary New Adult romance series, starting with High Contrast. High Contrast — coming May 3rd, 2016 from Samhain. Add High Contrast to your TBR shelf on Goodreads!